Secil Consolidation Mortar is a dry, pre-mixed mortar exclusively formulated from natural hydraulic lime. Secil Consolidation Mortar is a blend of select aggregates and natural hydraulic lime. It has thixotropic properties, good adhesion, chemical resistance and durability specifically adapted for the intended use. 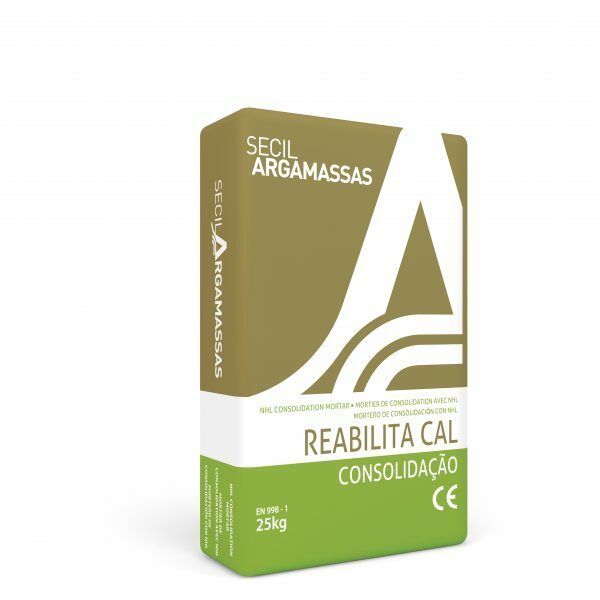 Use as a harled coat to provide a key prior to the application of lime render or Reabilita Cal Reboco. A 25 kg bag will make up 16 litres of mortar when mixed with water to the consistency for harling (5 litres of water per 25 kg bag). This gives coverage of approximately 5 m² at an average thickness of 3 mm. Use on old masonry in renovation systems, as a stabilising and consolidating layer of these substrates. Consolidation Mortar can also be used at a drier consistency as a natural hydraulic lime mortar. This gives a coverage of approximately 1.5 m² at 10 mm thick. The use of natural hydraulic lime and the special composition, results in excellent compatibility with old substrates. As well as the physical and mechanic compliance, there is also a high chemical compatibility. A 25 kg bag will make up 16 litres of mortar when mixed with water to a suitable consistency for hand harling. This gives a coverage of approximately 5 m² at an average thickness of 3 mm. Consolidation Mortar can also be used at a drier consistency as a natural hydraulic lime mortar, giving a coverage of approximately 1.5 m² at 10 mm thick.